In a TV interview to Simi Garewal on her show, 'Rendezvous with Simi Garewal', late Tamil Nadu chief minister had opened up about her political career and films. Simi Garewal: Whether it’s a movie star or a politician, few can match the charisma of my guest tonight. Or for that matter few can match her political skills or her sheer courage. I’ve been watching her from a distance for many years, and I’ve heard her described as intimidating, highly complex, imperious. When I met her in Chennai I was struck by how incredibly forthright and gracious she was. And very human. Dr J Jayalalithaa. Jayaji, such a pleasure to finally meet and talk to you. Thank you giving me this opportunity. Simi: I have watched your political career over the years. It’s been a very brave journey, more than perhaps a film script, hasn’t it? Jayalalithaa: It’s been a tempestuous life and career. Simi: You’ve been through trials, triumphs, crises. How is it that you’ve never shown fear or anger or any other emotion? I know you must have them. Jayalalithaa: Yes, of course, I’m human like everyone else. I do experience emotions and I wouldn’t be normal if I didn’t experience feelings of anger and other emotions but when you are a leader, you learn to control your emotions. You learn not to show them openly, you have to. Simi: Is it necessary to appear to be tougher than one actually is to be accepted as a leader in this patriarchal world of politics? Jayalalithaa: I’ve never consciously tried to appear tough. I suppose whatever I’ve done, my actions and reactions have made me appear tough. But I’ve never consciously attempted to appear tough. Simi: You always have this serene, calm exterior. I want to know what lies behind it. Jayalalithaa: I always keep my emotions to myself. They are not for public display. I have never lost my temper in public. I’ve never wept in public. Simi: How did you manage to do that? Jayalalithaa: I have a lot of will power, a lot of self-control. Simi: But do you think politics has made you tougher? Jayalalithaa: Of course, yes. I wasn’t like this at all. When I started out, I was very shy, terrified of meeting strangers. I’m a person who hates the limelight. Jayalalithaa: It’s very surprising. I’ve been propelled by fate into two very high-profile careers. But I’m really a behind-the-scenes person. Simi: Do you think your childhood has a bearing on your present life and your present personality? Jayalalithaa: None at all. I was brought up in a very traditional way by my grandparents. I was born into a Tamil Brahmin family, an Iyengar family. And I was brought up in a typical orthodox way. Simi: Your father died when you were two. Jayalalithaa: Yes. He was a gentleman of leisure. My paternal grandfather was a palace surgeon in the court of the Maharaja of Mysore. He had built up a great fortune but my father squandered away the family fortune. Simi: So your mother was a widow at the age of twenty with two children and she was very beautiful. Jayalalithaa: She was a very beautiful lady. Simi: That’s a very difficult position for a woman to be in. Simi: How did you subsequently enter films? Jayalalithaa: She was working in the secretariat in Bangalore. I had an aunt, my mother’s younger sister, who was a very bold and adventurous sort. She first became an air-hostess and that was considered very daring and adventurous in those days. After that she became an actress. Since my aunt was working in films, a number of producers and directors used to come home to see her. They happened to see my mother and they were struck by her looks. And Mother received a number of offers and that’s how she came to films. Simi: When you were in Bangalore, your mother was in Madras and you were about four years old. Jayalalithaa: When I was four years old, the family shifted to Madras and Mother became so busy with films that my brother and I were left entirely to the case of servants. So she thought this was not a healthy atmosphere to grow up in. So for four years, from six to ten, I was in Bangalore, living with my grandparents, separated from my mother. Simi: Was the separation hard? Jayalalithaa: I missed her terribly. Simi: Did she visit you often? Jayalalithaa: She visited me whenever she could, but that wasn’t very often. And I remember, when I was about five, and she had come to Bangalore to see us, I always used to cry whenever she left, so she used to put me to sleep and I always used to sleep clutching her sari pallu in my hands. I used to wind it tight around my hand. So my mother used to find it impossible to get up and leave. So leaving the edge of the sari in my hand, she used to gradually unwind the sari from herself, and she used to make my aunt drape the sari around herself and lie down beside me so that I wouldn’t notice her leaving. And then of course when I got up and found that Mother was gone, I would cry and cry and cry, I used to be inconsolable for about three days. But after that there was school and other things and I would get over it. But throughout those four years when I was in Bangalore, I was pining for my mother every minute, every second. Simi: You may say that childhood doesn’t have a bearing on one’s life, psychologically, Jayaji, it does. It carries through in one’s life. Jayalalithaa: Perhaps. When I look back in life, I seem to have spent so little time with my mother. I never really was satiated with the kind of love I expected and wanted and needed from my mother. Because there simply wasn’t enough time. I did come to Madras to live with her from the time I turned 10, from 10 to 16, but then Mother was so busy, she would leave in the morning, she would leave for work, before I woke up and most days she would come back home only after I had gone to sleep. I remember once I had won the first prize for an English essay I’d written at school and so I was so anxious to show this essay to her and show her the prize I’d won, I stayed up long part my usual bed time. It was I think midnight when Mother came back, and she found me sleeping on the sofa in the living room. And she asked me what I was doing there and why I wasn’t in my bedroom. I was holding the prize I’d won and my notebook with my essay in my hand, so I showed them to her. That is one of my treasured memories. Simi: You were stuying in a convent, weren’t you? Jayalalithaa: Yes. The days I spent at school were the happiest, most normal days of my life. Simi: Did you have normal schoolgirl dreams and crushes and things like that? Simi: He’ll be delighted. Did you ever get to meeting Shammi Kapoor? Jayalalithaa: I don’t think I ever met him, no. Simi: Sometimes it’s better to leave one’s fantasies as they are, don’t you agree? Jayalalithaa: One of my favourite films even today is Junglee, the yahoo song. Simi: What is your all-time favourite song? Jayalalithaa: I can’t think of just one, there are so many. Simi: Tell me some of them. Jayalalithaa: There was a song in Do Ankhen Barah Haath, ‘Ae malik tere bande hum’. That’s one of my favourite song. Simi: Can you sing it? Jayalalithaa: Not now, I’m out of practice. Then there was ‘Aaja sanam madhur chandni mein hum,’ from Chori Chori. Simi: Can you sing that? Jayalalithaa: Not now, I’m out of practice. Simi: Tell me, is it true that some of your school friends used to mock you about your mother being an actress? Jayalalithaa: Some of them, yes. Some of them used to do that. Simi: You’ve said that it gave you a terribly inferiority complex. Simi: What did they say? Jayalalithaa: You see these girls who came from the upper crust of society, born into wealthy families, and though I was born into a wealthy aristocratic family myself, those I was rather tongue-tied, if anyone insulted me or humiliated me, I didn’t know how to retort. I used to go home and cry. But today I’m very different. Today I give as good as I get or even more than I get (laughs). But it’s true that some of my schoolmates used to mock at me because my mother was an actress, and I think they did that because she wasn’t a leading lady. If she had been a topmost star, one of the leading stars of her time day, I think they would have envied me but Mother was a character actress. She used to play mother’s roles, sister’s roles, so probably that was the reason why they probably looked down upon me. Simi: Children can very cruel. Jayalalithaa: They can be. They were. But probably subconsciously I’d make up for that by standing first in class, I was a brilliant student. I stood first in every subject constantly, and when I left school I won the award for the best outgoing student of the year. I was the unanimous choice of the headmistress and the teachers. And till today I consider that my proudest achievement. Simi: At the age of 16, you were on the threshold of an academic career, you won a scholarship to join a college. That was when your mother pressurized into acting. Did you resist it? Jayalalithaa: I tried. For three days, there was a battle royal at home. I wept, I raged, I argued. But what can one do when one is sixteen? I was just a child and I couldn’t run away from home. And then Mother explained the family circumstances to me. She told me that she was not getting too many film offers. My grandfather had retired. We had to support my grandparents, my aunt and her children, and my brother hadn’t completed his education. So my mother let me understand that there was no other way out really, that I had to earn and support the family. So when she explained the family circumstances to me, I was, to put it mildly, shocked. Because until then I had the impression that we were very wealthy. Mother had never allowed her worries to bother me or my brother. Right from the time we were born, we grew up thinking we were millionaire’s children. She gave us the best of everything. Anything we wanted was there the next day. So we never really knew or understood how much she had to struggle to give us this kind of an upbringing. So when I finally understood, my whole attitude changed. Then I felt a lot of sympathy for my mother. And I thought Mother had been through enough struggle and Mother had suffered so much in her life that I felt it wasn’t fair to expect her to keep on struggling and keep on suffering for our sakes. Then I thought it was my duty to provide relief to my mother, and take on the burden of supporting the family. So that is when I told Mother to return the scholarship, and accepted the film offers that had come our way. But everything was handed to me on a golden platter. Offers were pouring in by themselves. So she said make use of it, why not take it. Simi: You’ve done over 125 films? Simi: How do you look back on your acting career in those days? 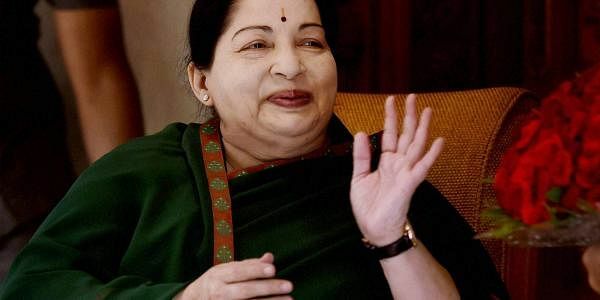 Jayalalithaa: Well, I was the number one star of my time in the south and I was a great success. Simi: You were a great success no doubt. Personally what was it like for you? Jayalalithaa: I didn’t like it. But when I decide to do something, whether I like it or not, I give it my all. I must excel in it. I must do it superlatively well. So, though I hated my career in films, though I was the number one star of my time, and though I really shouldn’t say I don’t like politics, people say I’m a successful politician. And a good one. I’m surprised myself. Simi: Did you like the process of pretending and dancing and impersonating, did you like that process? Jayalalithaa: I can’t say I liked it, but it came naturally to me. I’m a natural actress. I never followed any method. I never consciously tried to imitate anyone. I’m a spontaneous natural actress. Simi: Your mother was the driving force of your career, wasn’t she? Jayalalithaa: Yes, of course, but for her I wouldn’t have come to films, I’d never have learnt dancing. Simi: At 23 when she died, how did you manage without her? Jayalalithaa: I was lost. I was like a babe in the woods blindfolded because Mother was my whole world. But she never taught me anything practical. You see, she kept me so sheltered. Mother was 47 when she died. No one thought she would die so young. She probably thought she would be around for a long time to take care of me. She probably thought that I was so overburdened with work that these other things could come later. But the net result was that I was left absolutely helpless when she died. I didn’t know anything about running a house, I didn’t know how to operate a bank account, I didn’t know how to write a cheque, I didn’t know the meaning of income tax, I didn’t know how many servants we had, I didn’t know what their salaries were, I didn’t what the producers were paying me. So being an innocent babe lost in the woods, everyone could see that I was so naïve and vulnerable and innocent. Everyone took advantage of me. I had to learn everything the hard way. Simi: I believe you had said you even thought of ending your life. Things were that desperate at that point. Jayalalithaa: I think that is anything unusual. Sensitive people, emotional people go through these phases in life. It’s a part of growing up. Simi: But that feeling is the very end. Jayalalithaa: It is, no doubt. I have experienced that feeling. But I have overcome that and I have survived. And that is what is important. I didn’t succumb to that feeling. But of course I did feel lost when Mother died. I didn’t think I could manage without her, I didn’t I could cope with life for even a single day. But then look at me now. I’m surprised at myself. Simi: Your life changed when MGR entered it. You did 28 films together? Simi: And he brought you into politics. Simi: Did you fall in love with him. Jayalalithaa: I think everyone who met him fell in love with him. He was a charismatic figure. When I was a child, I used to see his sword fights, his fencing in films. And his partner in these films was the famous villain P S Veerappa. And after seeing these films, my brother and I used to come home and we used to have these mock fights with sticks. I was always MGR and my brother was always the villain. I always used to win because I was MGR. So the hero worship started when I was a child. Simi: What was he like as a person. He was a mystery to us. Jayalalithaa: He was a very warm and caring kind of a person. And after Mother died, he replaced her in my life. He was everything to me. He was mother, father, friend, philosopher, guide. Everything. He sort of took over my life. Jayalalithaa: Yes, both my mother and Mr MGR were very strong characters. They dominated my life entirely. They were the two major influences in my life. While Mother was there, she dominated my life completely. And after Mother, Mr MGR dominated my life completely. Simi: Were you in awe of him? Jayalalithaa: Not in awe of him. I was never in awe of him. But I respected him a great deal. I admired his intellect. And I had a lot of sympathy because he had a hard life too. Simi: He was very possessive with you, wasn’t he? Simi: He was very possessive of you. Simi: He didn’t want you to work in films outside. Jayalalithaa: No, but I did. Simi: He didn’t want you to. But you still did. Jayalalithaa: No, after a point I stopped working with other artistes. But I did the maximum number of films, 28. Simi: Jayaji, have you found unconditional love? Jayalalithaa: No. I don’t think there is anything such as unconditional love. I think it exists in books, in novels, in poems, in films. Not in real life. In any case, I have never come across anything like that. Simi: Would you say there is more male chauvinism in films or in politics? Jayalalithaa: I think both are equally bad. But in films, a woman is an essential commodity. Whether you like it or not, you need the glamour that women can provide. You can’t do without them. In politics, you can do without them, they try very hard to do without them. But where people like me are concerned, it’s not so easy to wish me away. Many people would love to. Simi: Jayaji, whenever a woman is successful, the world always manages to give the credit to a man. It seems to me that the greatest battles you have fought and won were after MGR died. Jayalalithaa: You are absolutely right. Because as long as he was there, he was the leader. I only had to follow his instructions. After his death I was left to fend for myself. I was left totally alone. And he didn’t smoothen the way for me to become his success. He didn’t. Not like Indira Gandhi did for Rajiv Gandhi. She groomed him, paved the way so that he could smoothly move to take over as her successor. Now if you look at all the other women leaders who have made it to the top in Asia, they were all the daughters, wives or widows of former prime ministers or presidents. Because if you’re a wife, automatically so much respect is given to you. People talk about you, refer to you, with respect. But such wasn’t the case with me. Though Dr MGR introduced me to politics, he certainly didn’t smoothen the way for me, he didn’t make anything easy for me. I had to fight and struggle my way up every inch of the way. Simi: Could you ever have imagined the path that lay ahead? Jayalalithaa: No, I think sometimes it’s a good thing that we don’t know what lies ahead of us. Because if I had known that I would have to traverse such a difficult, rocky thorny path, I’d probably have died of fear. Simi: What would you say was your hardest time? Jayalalithaa: The biggest battle I had to fight was to consolidate my position in the party, to assert my supremacy after his death. That was the most difficult and traumatic time. My heart was not in it, but then there are times when you have to just keep going, when you have to keep going, you can’t stop. Simi: Why do you say your heart wasn’t in it? Jayalalithaa: There was so much mud slung at me, I had to face so many brickbats. I had to face so much vilification and slander. That hasn’t been easy. If I had been an academician, if I’d been a lawyer, no one would have said such nasty things about me. When people interview an actor or a professional like a doctor or lawyer, the very attitude is so respectful. But when it comes to a politician, the questions are so downright demeaning, insulting, humiliating. People who know nothing about you, who’ve never met you, say such vile things about you, and you have to take it with a smile. That’s very difficult. And it’s not true that if you are in politics long enough you grow a thick skin. It never happens. If you are born sensitive, you stay sensitive till the end of your life. If you are hypersensitive like I am, you feel the pain magnified a thousandfold that perhaps another person would. And then having to face this kind of slander, the kind of terrible distorted image that has been built up of me in the media. That really hurt. That’s not me, that’s not what I am. Simi: Do you think that you intimidate men? Jayalalithaa: You must ask them. I think I do. (Laughs). Nowadays most men I meet are terrified of me. Simi: Why do you think? Jayalalithaa: Probably it’s this image I have. And I don’t take any nonsense from anyone nowadays. That old Jayalalithaa is gone. The Jayalalithaa who used to be tongue-tied when someone insulted her, when someone was rude to her, who didn’t know how to answer back, who didn’t know how to retort, who used to keep quiet, who used to withdraw into herself, who used to cringe inwards, who used to go home and shut the door and cry in a dark room. That Jayalalithaa has gone, dead forever. I don’t think I’ve said this before, I’m saying this now, I’m not one who goes looking for a fight. Generally I’m very reserved. I speak only when I’m spoken to. But if a fight comes my way, I won’t run away. And nowadays, if someone gives me one blow, I’ll give back ten. I don’t take nonsense from anyone nowadays. Life has made me like that. I wasn’t like this before. In fact, I’m surprised at the way I have changed. Simi: Your critics, your male critics have implied that you are a man hater. Are you? Jayalalithaa: No, not at all. I’m not a man hater. And not my male critics. Some of my worst critics have been women. I can’t say which one is worse. Simi: Do you trust people easily? Jayalalithaa: I used to. I was very naïve, very vulnerable, very gullible. But now I know better. But still, my basic instinct is to trust. I have to fight it. Jayalalithaa: Yes. Certainly. I’ve been disillusioned by the world, by life. If I could I’d like to retire to the mountains and live like a sanyasin. Mentally that’s how I am living. Simi: Would you say you are a good judge of people? Simi: What does a person have to do to win your trust? Jayalalithaa: They just have to be straightforward. Simi: How would you tell? Jayalalithaa: I can make out. I can tell. Nowadays I can. Simi: How do you deal with criticism? Jayalalithaa: I don’t think anyone has taken more criticism than I have. Simi: Do you cut it out of your life, do you deny it, do you let it affect your life, do you pay heed? What do you do? Jayalalithaa: The thing is I have been kept so busy, I never really had the time to sit and think about it. If I had it would have shattered me. Simi: Jayaji, you have come in for a lot of criticism because of your association with Mrs Sasikala. And yet you continue to stand by her. Why? Why do you do this? Jayalalithaa: She is a much misunderstood maligned person. And she has been the target of a lot of vilification and persecution simply because of her loyalty to me and her closeness to me. If it had not been her friendship with me, no one would have attacked her in the way she has been attacked. You know, she had to spend nearly a year in prison. She has suffered a lot. Most of the criticism has come from men. Men who are politicians too. You see, it is impossible for someone who is in the thick of politics to run a political career and manage a household. But most men don’t understand this. Because they have their women at home. They have their wives or mothers to look after their personal needs. Now for example, I can’t go out shopping. Someone has to do my shopping for me. And I have to leave at odd times, I have to leave in a hurry. There’s no time for me to lock up the house or to see that everything is safely put away. I just can’t attend to these practical things. Someone has to manage things for me. She does all that. So she to me is the sister I never had. And she has taken my mother’s place, she looks after me. There are many who think it would be useful to them to be in her place. So these are the people who created all these nasty stories about her. Because they tried to separate her from me and tried to worm their way into my good books and tried to get into the place that she occupies but they didn’t succeed. Simi: But they have cast so many aspersions and insinuations about her. How do you deal with that? Jayalalithaa: In fact I filed a defamation suit against a former Union minister for casting aspersions on my relationship with Mrs Sasikala. That is Murasoli Maran. I filed a criminal defamation suit against him. Simi: Jayaji, there are all these criminal cases against you. Are you troubled by them? Jayalalithaa: Not at all because I know that I’ll be vindicated in the end. All these cases that have been foisted against me are all politically motivated. They will not stand up in the court, and I will win in the end. Simi: Do you think that people in power can sometimes get carried away by the trappings of power and lose their perspective and then they only realize it in hindsight. Jayalalithaa: It happens very often. It is every easy to get carried away by the trappings of power. But you need to have someone with you who is always there to bring you down to earth. Now when my mother was alive, I could always depend upon her to tell me the truth. And she was always there to bring me down to earth with a thud.Whenever it looked like I was getting carried away, now when Mr MGR was alive, I could never dream of getting carried away. He was always there to give me a knock on the head and bring me down to earth. Now in my case Mrs Sasikala does that. I can always depend upon her to tell me the truth as it is. And if she feels something is going wrong, she never hesitates to tell me so. And I take it from her as I would when my mother was alive. Simi: You have been attacked, humiliated, injured, jailed even. Do you ever feel it is not worth it?Well, I don’t need this? Jayalalithaa: Nothing really was worth the humiliation I suffered when I was attacked in the Assembly, on the floor of the Legislative Assembly on March 25th 1989. In the presence of the chief minister, Mr Karunandhi, with both his wives watching from the VIP boxes. All his ministers and MLAs physically assaulted me. They grabbed everything they could lay their hands upon, chairs, mikes, a heavy brass bell on the speaker’s table. If they had succeeded in banging it on my head, I wouldn’t be alive today. My MLAs saved me that day. And one of them even tried to pull at my sari. They pulled at my hair. In fact, they tore out some of my hair. They threw chappals at me. They threw heavy bundles of papers, books at me. That day I left the Assembly in tears. But I was also angry. I made a vow that day. I said I will never set foot in this Assembly again as long as this man continues to be the chief minister. And when I do enter this Assembly again, I will enter as chief minister. And I fulfilled my vow within two years. I did it. I don’t think this has happened to any other woman in politics. That was a bad experience. Then my being sent to jail. That was I think the worst moment of my life. It was a miserable situation. Among all the prisons in Tamil Nadu, the Madras Central Prison is the worst. It is the most unhygienic, dirtiest prisons imaginable. And the place where I was kept, was a condemned building. This was reopened in my honour. You must have seen some of these old English movies where they show these medieval dungeons. It was exactly like that. A dark dungeon, it had not been swept or cleaned for years probably, there were cobwebs hanging everywhere, growth of fungus everywhere and all kinds of vermin crawling all over the place. You could have conducted a zoology class there. There were big rats, sewer rats, bandicoots. I had to sit or lie down on the bare floor, and our Madras Central Prison is situated bang on the banks of the Cooum river, which is nothing but an open sewer. It was stinking to high hell. I stayed there for a month. Jayalalithaa: I didn’t cry. I didn’t shed a single tear. I steeled myself the moment I was made to step inside the police van. I said I will bear everything whatever comes with fortitude. I was absolutely calm, absolutely dignified. I didn’t throw any tantrums. They were asking all these questions: Is she crying, is she upset. They were trying to break my spirit but they didn’t succeed. It was one of the worst times in my life. Simi: Politics is a very brutal process. Has it made you cynical? Jayalalithaa: I think it would make anyone cynical. But I’m not a true cynic though I try to sound like one. Jayalalithaa: At home. It’s very difficult to put up with me at home. Simi: Really? Who suffers the consequences? Jayalalithaa: Sasikala! My staff, poor things, I’m a very demanding, exacting task master. Jayalalithaa: I used to be. Nowadays I weigh every step, I measure every step, I weigh the pros and cons. I think about the possible fallout of any act of mine. I wasn’t like this before. Simi: Why did you never marry, Jayaji? Jayalalithaa: It just never happened. Simi: But did you ever someone you’d have liked t have married? Jayalalithaa: Not really. I did like the idea of marriage as any young girl would. Every young girl dreams of meeting the perfect man, her prince charming, or marrying him and living happily ever after. I too had those dreams as a teenager, as a young girl. If my mother had got me married at the age of 18, even an arranged marriage, I’d have settled down happily in a life of domesticity. I’d have been content looking after my house, raising children. But life taught me that such things don’t happen to everyone. And it’s unrealistic to expect happiness in life. Simi: Do you missing not having a complete family? Jayalalithaa: Not at all. I value my freedom, my independence. And looking around me at so many failed marriages, and looking at all the unhappiness that people have to endure in bad marriages, and in many families, I’ve seen children are so ungrateful to their parents. Nowadays young people are so insensitive, they just abandon their aged parents, throw them away into old age homes. But when I see all this, I think it’s a good thing that I never got married, I never had children. I wouldn’t have it any different. I like the way I’m living now. I’m free to make my own decisions. Of course I have obligations to my party workers. I have my obligations to the public. I have my duties to fulfil. But personally I am untied, unfettered, unbound. I don’t have to think in terms of pleasing anyone. That makes me sound very selfish, but not really. You see, for most of my life, I’d say for one third of my life, I was entirely dominated by my mother. I’d do everthing that she wanted. I could never do anything I really wanted. Then, for the other part of my life, I was entirely dominated by Mr MGR. First, I had to enter films for my mother’s sake, then I had to enter politics for Mr MGR’s sake. Now I’m passing through the last phase of my life. Two-thirds of my life is over, one-third remains. Now I’m living for myself. But you still you see there is the hangover, rather the consequences of my earlier life that can’t be wished away. There are some responsibilities, some duties that I have to fulfil. I have pledged that I will bring back my party to power in Tamil Nadu. I have to achieve that. Then when I will be able to say goodbye to politics, then I will really be free. Simi: Jayaji, this has been a wonderful evening for me. I cherish this time we spent together. I want to thank you for being so honest and so gracious. Jayalalithaa: It’s been a wonderful experience for me too. And it is a tribute to your charm and charming persuasion and talent that you’ve been able to elicit answers from me which no one ever could dream of doing until today.